I've been playing around with the Super Antenna, the MP-1 portable, www.superantennas.com. This is a portable antenna, rated for transmit and receive from 7 to 50 mhz, up to 300 watts. An optional extra loading coil is available for frequencies down to 80 meters. The antenna itself, sans mount, consists of two aluminum rods, a massive loading coil, and a telescoping whip, all of which thread together to form a vertical antenna. Broken down, it fits into a box that is about 18"x4"x4". Assembled, it's probably eight feet high, with the whip fully extended. The parts are made of heavy aluminum and steel, and seem very well constructed. It weighs just a few pounds. There is a four-wire counterpoise; this is a ribbon cable that has been split into four segments, free at one end of each segment, and all four bound into a clip at the other. The clip fits onto a tab on the mount, and the four segments are then spread out around the mount. It comes with a mount that is a heavy, flat aluminum bar. One end has a nut and SO-239 connector, to allow the antenna and coax to screw in, respectively. The other end of the bar, which is about 5"x2"x1/4", is clamped with a standard C clamp onto a flat surface, such as the edge of a table. There is an optional tripod mount that can be used instead; this consists of three heavy aluminum rods with plastic caps on the ends; they screw into a hub that has the SO-239 and nut for the coax and antenna to attach to. This is what I have been using. It's recommended that the tripod not be placed directly on the ground, for reasons not given. The tripod lifts the antenna about four inches above the surface that it stands upon. Once mounted, the antenna is tuned mainly by adjusting the coil segment of the antenna. This consists of a heavy loading coil, covered by an aluminum tube. The tube can be shifted up and down the coil to change the location where the coil is tapped. For higher frequencies, the whip can be adjusted, as well. I have gotten good matches, 1.5:1 or better, on this antenna on 40 meters, even with it standing directly on the ground. However, on 20 meters, it was difficult to get a good match without putting it on a box that lifted it up a few feet above the ground, and then shortening the whip. I have not tried it on any higher frequencies. I have been able to make contact without too much trouble on 40 meters and maybe even a bit below, as well as on 20 meters. The antenna is also pretty good at reception over a moderate range around the frequency that it is tuned to. Once you get the hang of it, this antenna sets up in just a few minutes. I plan on taking it on vacation to the west coast, just to see if it's practical to fly with it without having the Feds toss me into prison. I'll let you all know. Otherwise, I think it's a pretty good deal, especially at only $100. With ant compact antenna system the counterpoise, feed point impedance, and grounding become even more critical. It will still work well and be a lot of fun! Good luck & have fun. 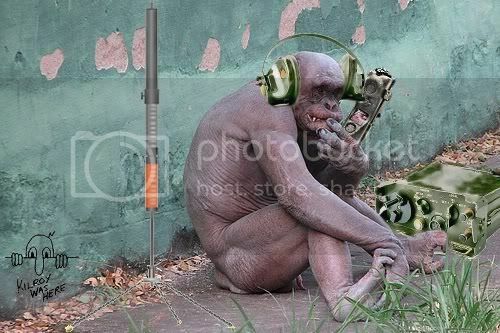 I've been told the Super Antenna is so easy to use, even a monkey can operate it.